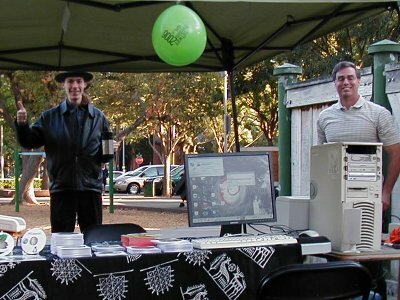 The Linux Users' Group of Davis, California, will be participating in 2010's Software Freedom Day event, Saturday, September 18th! Members from LUGOD will be at the Davis Food Co-Op's "Demo Station", near the meat department. Drop by to try out Linux, ask questions, get software CDs, and more! Software Freedom Day is a global, grassroots effort to educate the public about the importance of software freedom and the virtues and availability of Free and Open Source Software. Local teams from all over the world organise events on the third Saturday in September. The most recent event involved over 200 teams from all over the world. LUGOD has participated in this event in previous years: 2004, 2005, 2006, 2007, 2008. If you'd like to help out for this year's event, please post a message to our general discussion mailing list, 'vox' or contact pr@lugod.org. More information on our hands-on demos, and on our participation in this year's Software Freedom Day event can be found on our demo project page. Sept. 18 - Happy Software Freedom Day! See you at the Co-Op between 4pm and 7pm this evening! Sept. 3 - The Davis Food Co-Op says we can use the Demo Station for our Software Freedom Day hands-on Linux demo from 4pm to 7pm that day. Computers - Laptops work well for events like this. Bill is bringing a Kubuntu 9.04 laptop and a MyTouch Slide Android phone. Volunteers - Tim Riley has offered to help staff the booth. Hand-outs - Bill will photocopy some handouts (such as these) and any new event flyers to give out to people.